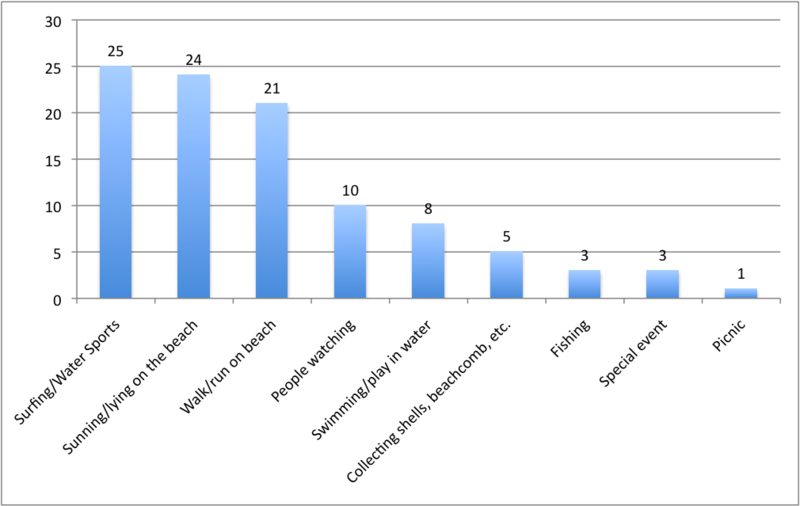 For one year, starting in July 2008, 462 beach visitors were interviewed. In an earlier post entitled "Intercepting Surfers", I discussed the fact that surfers have a different daily pattern of beach use than typical beach goers. Surfers are more likely to use the beach in the mornings and evenings than beach goers whereas most beach goers tend to visit the beach in the middle of the day. Because studies on beach use typically focus on beach goers, they tend to sample during the middle of the day when the crowds are at their peak but at a time when surfers might be missed. It has also been assumed that there are usually more beach goers than surfers. A recent study of beach attendance in the City of Solana Beach (San Diego) conducted over an entire year found that surfing was the most common primary purpose for being at the beach. See graphic above. 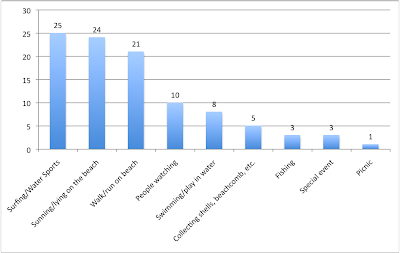 While it could be argued that some of the other categories in combination represent "beach going", this study is notable in finding that surfing is such a strong driving force for visiting beaches in the City of Solana Beach.